Peloponnesian War (431-404 B.C.) - The cooperation between Greek city-states fighting against the Persians could not last once the threat was eliminated. Soon after the Persian Wars, the two most powerful cities, Athens and Sparta, became chief rivals. Despite both being Greek, they had very different political systems and ambitions. Sparta was an oligarchy and wanted to dominate the other city-states. Athens was a democracy (one of the world's first) and wanted to build an empire. 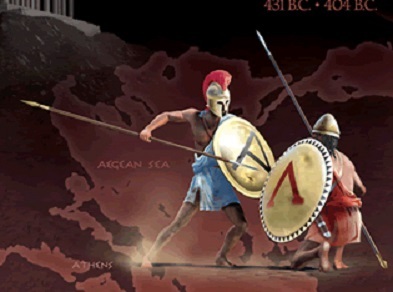 In 431, their interests clashed and they fought a 27-year war in which Sparta emerged victorious.